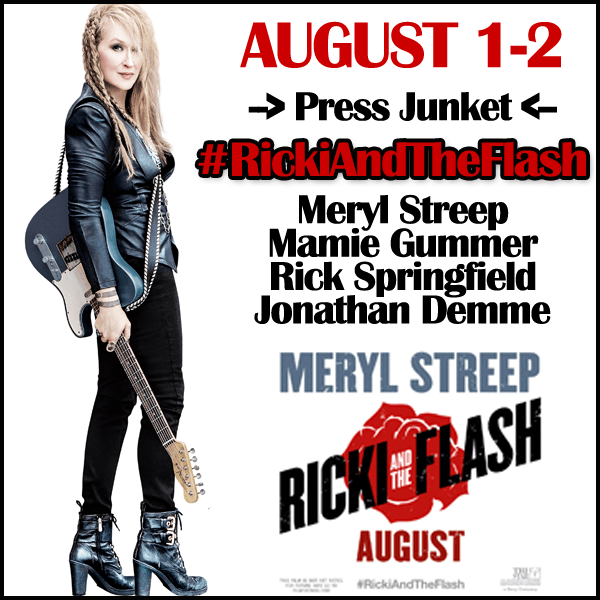 Ricki and the Flash Press Junket - I am headed to New York! You are here: Home / Movies / Ricki and the Flash Press Junket – I am headed to New York! Ricki and the Flash Press Junket in New York! I JUST got invited to travel to New York to attend the Ricki and the Flash Press Junket! First of all, you know how much I love movies. Going to the movies is the best form of therapy that I have that allows me to escape the realities of the real world and enter the imagination of talented film creators! Sony has a NEW movie coming out called Ricki and the Flash! This movie stars Meryl Streep & Rick Springfield! I am humbled by the opportunity to take a last minute trip to New York to screen the movie and interview some of the talented actors and creators! If you haven’t heard of this film yet, please be sure to check out the trailer I posted below! You might need tissues from either laughing or crying! Follow the hashtag #RickiAndTheFlash next weekend! I will be sure to try to bring you some very exclusive coverage! That sounds like loads of fun. I just love Meryl Streep! I love movies with Meryl Streep in them! I can’t wait to see this. I’ve been seeing the previews for this on TV, it looks very interesting! I think Meryl should know that she has an enormous impact of her “Streepers” lifes and that she helped us in many situations without even knowing that we exist.